I really am trying to work through some of my "stash." I don't need any more fabric. 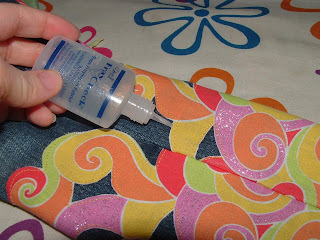 I've got tons...but I saw this fabric at Wal-Mart a couple weeks ago not to long after seeing this post about appliquing pants and it was screaming to me to put it in the cart and turn it into some appliques. Bright swirls with sparkles are a sure fire winner at our hosue. I figured for a buck, I'd splurge and spoil Firecracker. Remember the weird pants that needed a snap rehab? Now comes step two...add some bling. The pants were too long, so I cut a few inches off the bottom. 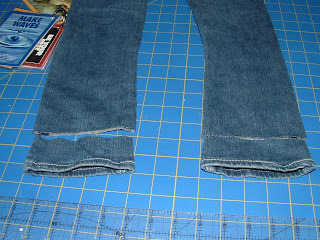 (If you're shortening your pants, remember to leave a little extra for the hem.) If you're not shortening your pants, it's even easier. Then open up one of the leg seams. I did the outside seam because it was single stitched and the inside was double stitched. The appliques might look a little better if you open up the inside seam, though. 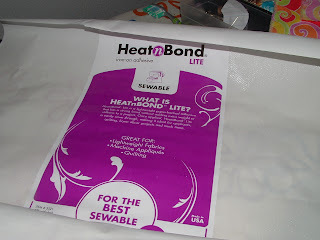 Then I cut out the fabric I wanted to put around each of the legs and ironed Heat 'N Bond Lite to the back. Make sure to put paper or something underneath to protect any extra Heat 'N Bond from getting on your iron or ironing board. Trim your design the way you want it to look. 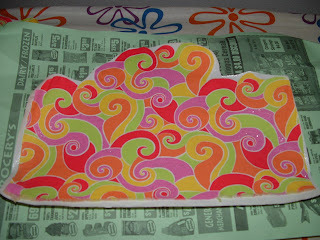 I followed the swirl lines and cut some of the shapes out of the middle to add interest. 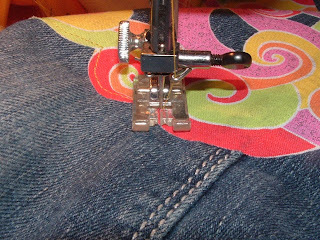 Iron your applique onto the pants legs. 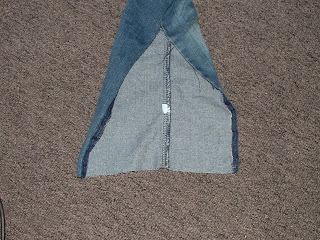 I did it all the way to the bottom, so it would be caught up in the hem. This made the hem pretty thick, though, so you might want to do it a little above. 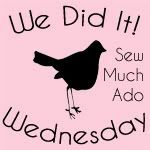 I sewed with a straight stitch around all the ends, including around each of the shapes I'd cut out of the middle of the applique. 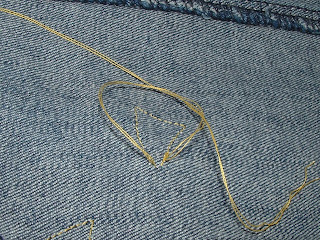 Leave the tails longs, so you can pull them through and tie knots to secure the ends, without having extra stitching show. 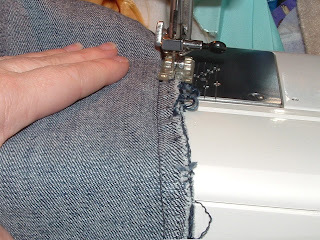 Re-sew your the leg seams. If I had it to do over again, I'd probably have made the appliques just a bit shorter because they look a little like really girly cowgirl boots (but that's about perfect for around here anyway.) 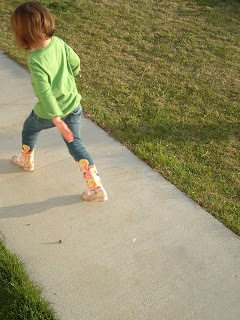 Firecracker says these are her favorite pants...except her other 5 favorite pairs. 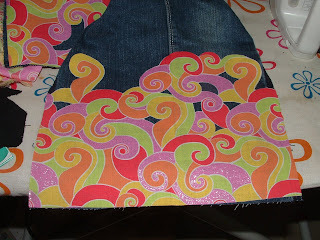 Or click here to see a way to use applique for knee patches. I thought I'd get a Hand-Me-Down Rehab Linky Party going in case any of you have your own rehab projects going on you want to share. Even though most of the projects I'm doing involve clothes, feel free to link up other rehab/refinish/reinvent/remodel/re-whatever projects you've been working on. 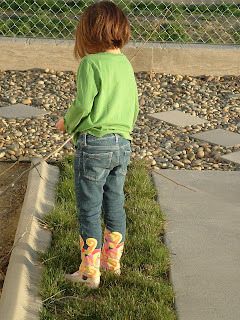 If you link up, I'd appreciate it if you'd grab a Hand-Me-Down REHAB button or a Helping Little Hands button and put it in your link post or somewhere else on your blog to let others in on the fun.